AVI save Dialogue is called by File Menu. The Menu brings the dialogue used to initiate and set some options of the animated clip file (AVI). Note the use of this feature might need the CODEC filters installed on your PC. CODEC is coding-decoding filter used to compact your data for optimum file size/quality ratio. There are several Codec’s available and included into Windows 95/98/NT/ME/2000/XP/Vista. Some others are available on WEB as commercial products or for free. We do not include Codec’s in our distribution package. Please contact us for details on Codec’s use and installation. 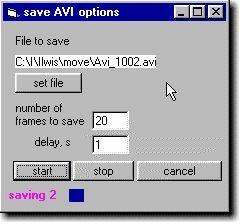 You can always use uncompacted option for saving AVI and compact the files with dedicated software. If you are not experienced in using Codec’s we recommend to use stable (but not the most effective) “Cinepak Codec by Radius” in compacter selection dialogue. The dialogue is used to name output file, adjust some options and provide visual control of AVI creation process. On pressing Start you will get compacter selecting dialogue. For best Quality / Size you can consider DivX free codec. NOTE : some of the Codec’s have restriction on size of the movie window. For example DivX Codec accepts only sizes as integer multiple of 4 for both height and width. The size of the output movie is determined from the current size of the 3D control in pixels. You can adjust the size prior to AVI creation. Use Form resizing, Width and Height of 3D window is indicated at status bar "h,w=200,200" means 200x200 pixels. The <Set file> button is used to name output file. On loading form last file saved is used as default name. Use "Number of frames to save” box to set desired number of frames (within 2...500). Delay, s indicates the time interval between <Start> button click and actual start of frames saving (within 0...100 in seconds). Delay active sign is shown during delay time as hourglass picture left of the delay box. Status of the current AVI progress is displayed at lower part of this form “saving frame number” and progress bar.